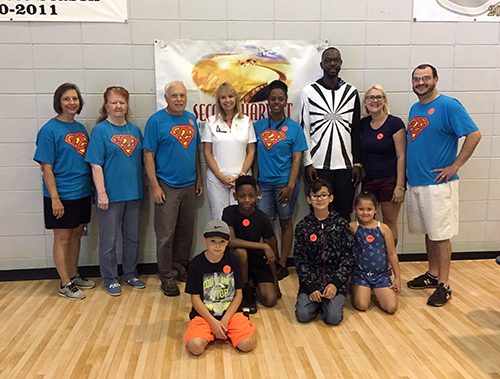 On June 16th, several a2b Fulfillment volunteers rolled up their sleeves to help with The Second Harvest Food Distribution in Greensboro, Ga. Held the third Saturday of each month, Second Harvest provides several tons of food to area families in need. In addition to providing volunteers, a2b Fulfillment was a financial sponsor for the June event that included distribution of nearly 9,000 pounds of high quality food to 155 families who represented 400 individuals. The Second Harvest food distribution is a signature project of the Rotary Club of Greene and Putnam Counties with a mission to eliminate hunger. Food for the program is obtained through leveraging cash donations, rescuing excess food from The Ritz-Carlton Reynolds, Lake Oconee and Publix Super Market, and through an accredited partnership with Golden Harvest, a food distribution agency of the Feeding America program.